Разработчик Huuuge Games Sp. z o.o. The iOS hit has finally arrived, reinvisioned as a free-to-play game! * Game of the Year (Action) TouchArcade * Game of the Week, PocketGamer * “must have”, SlideToPlay review – 4/4 * “Console-quality action”, 148Apps review – 4/5 ...these plus many more glowing reviews! 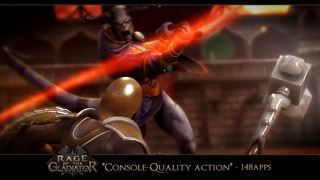 The NEW free-to-play version has: * All-new achievement mission battles Can you survive them all? Over 90 battles in total! * Unlock the legendary Brutal Victory skill via daily rewards * All new weapons, armor, shields, and helmets available in the Shop * Magical items and treasure chests to help you progress Download it now and experience Rage of the Gladiator -- the ultimate gladiator fighting experience! 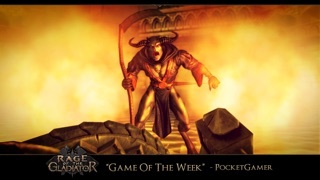 ABOUT RAGE OF THE GLADIATOR You play the role of Gracius, a gladiator battling for his life in the arena. Your opponents are no ordinary evil, but are epic boss fights whose tricky attacks will challenge even the most elite gamers. There are no ‘fodder’ enemies – its all bosses -- the most fun part of games! Beat them before they brutally beat you. Armed with your magical war hammer and a trusty shield, you must exploit their weaknesses by jumping, dodging, shield blocking, or counter-attacking with proper timing, agility, and thinking. Then unleash your rage by brutally pounding your enemy with your war hammer, and perform over-the-top combo finishers such as summoning a a vicious lightning storm or a deadly pillar of fire. 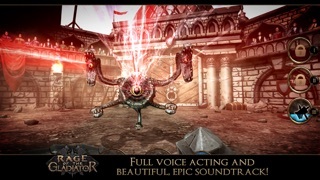 HIGHLIGHTS * Stunning 3D graphics, optimized for the Retina Display on the new iPad and iPhone 5 * Full voice acting. Each boss has its own personality, and taunts you mercilessly! * Extremely realistic animations. When you attack bosses, the impacts and hits feel “real.” * 14 insane finishing moves. Summon a fiery meteor, a savage tornado, or transform into a hulking colossus 10x your size! * Customize your character with new weapons and armor. * Gain new powers and skills! How will you build your character? Choose Offense, Defense, or Magic. * Epic music. Enjoy blood-pumping masterpieces by legendary composer Sean Beeson! * Great replay value. Beat the game to unlock new difficulties, where bosses are much tougher with all-new abilities! Dozens of hours of gameplay! * An exclusive armory to customize your character * Beautifully rendered introduction * Game Center leaderboard and achievements * A monumental undertaking, with content comparable to a console title, but for FREE! 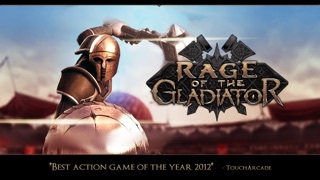 Rage of the Gladiator is (c) 2009, 2012, 2013 by Ghostfire Games. Follow us on Facebook and Twitter and stay in touch to get all the latest information about Rage of the Gladiator and future updates: facebook.com/RageOfTheGladiator twitter.com/rage_gladiator twitter.com/gamelion Download it now and experience Rage of the Gladiator -- the ultimate gladiator fighting experience! Как же мне нравиться эта игра! На Ipad mini после первого боя игра вылетает! Исправьте пожалуйста. Больше Huuuge Games Sp. z o.o.